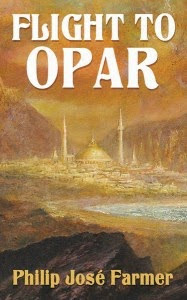 The exciting adventure-filled sequel to Hadon of Ancient Opar! Hadon of Opar was the winner of the Great Games and the rightful claimant to the throne of Khokarsa, a mighty empire that stretched along the shores of ancient Africa’s great inland seas. But the old king has refused to surrender his power, and Hadon finds himself caught in the middle of a bloody civil war between the zealous priests of the sun god and the beneficent priestesses of the great mother goddess. Now a divination of the oracle hurls Hadon on his most dangerous adventure yet. With a tyrant’s armies and warships hot on their heels, Hadon and his companions must set out on a journey through perilous jungles and across storm-wracked seas to reach the city of his birth—for only in far-flung golden Opar can he fulfill the oracle’s prophecy and save the land from utter doom. Meteor House is excited to announce the never-before-published Restored Edition of Philip José Farmer’s classic novel Flight to Opar, the second volume of his acclaimed Khokarsa series. This new edition—available as both an affordable trade paperback and a collectible limited edition hardcover—features nearly 4,000 words that were cut from Farmer’s original manuscript when the novel was published in 1976. Meteor House’s Restored Edition is the first and only publication of the novel ever to include the excised material, which encompasses long passages of narrative, dialogue, and rich world-building details on Ancient Opar and the civilization of Khokarsa that readers have never previously been able to enjoy—until now. ** Only previously available in an out-of-print and extremely hard-to-find signed limited edition. The trade paperback edition is $20 (plus shipping). The hardcover limited edition is $30 (plus shipping). Or you can buy them together for only $45 (and save even more on the combined shipping)! Due out in the Summer of 2015, be sure to preorder early to ensure you get a copy of the limited edition hardcover, signed by editor Christopher Paul Carey. As always, the print run will be determined by the number of preorders received. Not many copies beyond those reserved will be printed. While the trade paperback edition will not have a short print run, if you preorder a copy before publication, it will also be signed by editor Christopher Paul Carey.